After all, you’ve read the blog posts and the ebooks. You know how crucial it is to go out with your guns blazing and take full advantage of the hype. 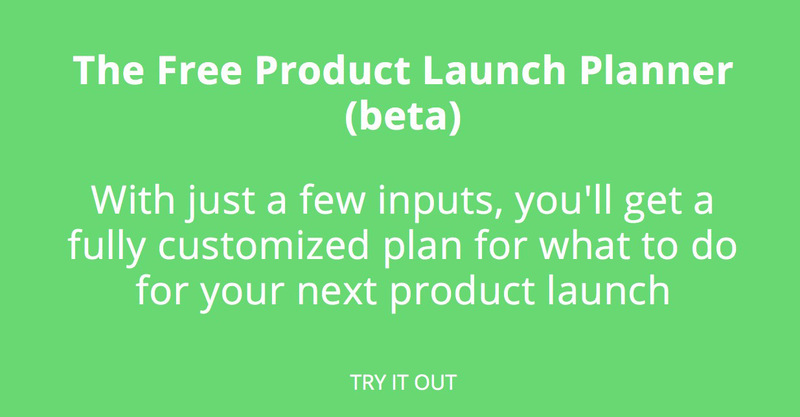 However, even though a ton of digital ink has been spilled on optimizing your initial launch, there isn’t a lot of advice on launching a new feature or product release on Product Hunt. Until now. We believe in doing product launches right, which means putting just as much time and effort into relisting your product as you did the first time around. Before you do anything else, you have to figure out if your new version or feature is eligible to be hunted. According to the Product Hunt FAQ, you can re-submit a product when the update is “substantial.” Wait, you’re thinking, what does substantial entail, exactly? Hmm, still a little vague. 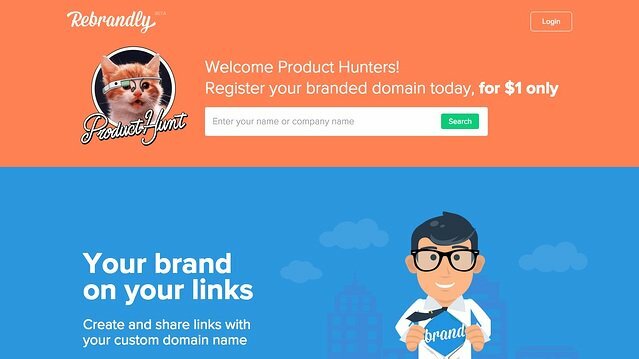 Luckily, since apps are relaunched on Product Hunt all the time, you can check out some real examples. Two popular ways to relist on Product Hunt are through new versions of your app (think 2.0) and new features. The first time Liquid was hunted, it was billed as an app customization tool for developers. In March 2016, it was hunted again—and even though the name was the same, the product itself was completely different. Now, rather than providing a SDK so engineers could create unique layout and application workflows for different user profiles, Liquid automated your app communication. The UI had been completely revamped as well. Marker, which lets you easily take and share screenshots, was re-hunted just six months after its initial launch. According to creator Gary Gaspar, the Marker team completely updated the UX, changed the onboarding flow, added a Jira integration, rolled out an emoji feature, created a new screenshot editor, and more. Medium 2.0 definitely came with plenty of changes. Five months ago, it was hunted for the second time; updates included major overhauls of both the iOS and Android app, a mention feature, a new writing experience, custom domains, a publishing API, and to top things off, a new logo. When InVision was hunted a year ago, it was already a popular tool (in fact, Ryan Hoover used it to create mock-ups for Product Hunt!) And every couple months, when the InVision team adds a new feature to the app, they also release it on Product Hunt. For example, Photoshop Artboard Prototyping, Do (a to-do UI kit), its Sketch integration, Boards, and its Apple Watch app. Marvel has also used PH to publicize its new features, specifically: its mobile apps, its Sketch plugin, its Lookback user testing integration, and its embed feature. Once you’ve decided your upcoming release is eligible, contact Product Hunt’s support team (support@producthunt.com). Laura Noodapera, Lead Generation Manager of Teamweek, says she sent an email asking to submit a new post for Teamweek 2.0. “We had made a lot of changes to our online project planner and team calendar, so for submitting it again I just had to explain what we had done,” she explains. And be prepared to answer some questions: Noodapera says she exchanged multiple emails with the team before Teamweek 2.0 was approved. However, I also talked to a couple teams who relisted their products through the traditional channels. For example, when Zapier wanted to submit Multi-Step Zaps to Product Hunt, CEO Wade Foster simply used his Maker status to submit it. When Gaspar launched Marker 2.0, he asked a friend with a large following on Product Hunt to hunt it for him. Although it’s clear you can get relisted in multiple ways, your best bet is still contacting Product Hunt’s support. This method lets you control the timing of your launch—which, as you probably know from your first PH go-round, is crucial. You might’ve heard tales of products that were hunted before their teams were ready. On the one hand, woohoo, you’re on Product Hunt! On the other, oh no, you’re on Product Hunt and you’re nowhere near ready for the spike in traffic or users. Insert four-letter word here. “We’d planned to launch Hours 2.0 publicly that afternoon, but I woke up in the morning to the app being on the front page of Product Hunt. It was the #2 hunt by the time we actually launched the product publicly,” says Jeremy Olson, the app’s creator. While Olson was excited about how much exposure being on the front page was generating, he was also panicked because the team was planning fix a few key issues before the public launch. You can avoid the issue entirely by coordinating your product update or feature release at the same time as your Product Hunt post. “We launch releases early in the morning Eastern Time, and we coordinate PH to go live at the same time—within the same hour, at the bare minimum,” says Clair Byrd, Director of Content for InVision. And since we’re sure your team already has its hands full on launch day, set up all of your Product Hunt preparations ahead of time. That way, you’ll only need one or two people to manage the PH launch—everyone else can focus on answering user questions, fixing any last-minute bugs, talking to the press (fingers crossed you get some), and so on. Remember that your launch will be seen by two completely different audiences. First, you have the group of Product Hunters that already use your product. Then, you have the much bigger group of Product Hunters that don’t: because they don’t know it exists, or use an alternative product, or simply don’t see the need. Most companies use their launch to convert members of the second group into users. If that’s your strategy, explain not only what’s changed about your product, but what it does in the first place. 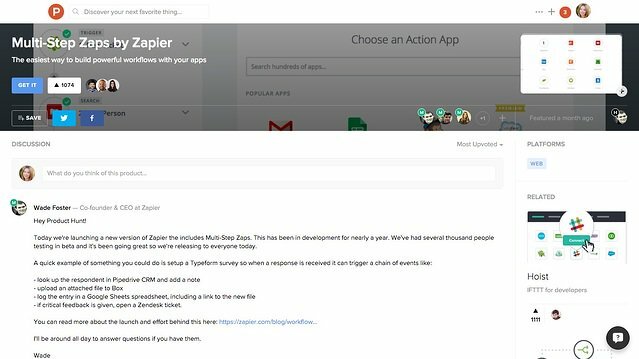 When Zapier launched multi-step Zaps, the main motivation behind their Product Hunt launch was getting more users. Stych explains that “sign-ups were key” because Zapier already has a lot of ways to communicate with its existing users. However, you can also use Product Hunt to drive feature adoption among current users. There are three general categories of supporters (spoiler: you’ll want to get help from all three). First, you have your power users. Obviously, the definition of a “power user” will be different for every product, but these are the people using your most advanced or niche features, logging the most time, or using your product the most frequently. Since they’re clearly enthusiastic about your product, they’ll likely be happy to comment and upvote your product. On the day of the launch, start sending out those emails. Stych says the Zapier team spent the whole week after launch day emailing their power users. With Gorgias, you can create a text template, insert it into the body of your email with a simple keyboard shortcut, then tweak the message to make it personal. It’s quicker (and easier!) than copying and pasting each individual email. Moving on to your second group of supporters: your network. In this category, you’ve got your mentors, your advisors, your company partners, your professional connections, and so on. Make a big list of everyone you know that could help promote your PH launch (either by upvoting or commenting on your page or sharing the link on social media). Then, draft and save emails to each person. It was great running into you last week at SXSW—your newest venture sounds really exciting, and I’d love to hear about it over lunch the next time you come down to the city. Feel free to share the love on social, as well! Boomerang (for Gmail) and HubSpot Sales (for Gmail, HubSpot, and Outlook) let you schedule when your emails will be sent. Once you’ve written the email and picked a date and time, your job will be done. Finally, in the third category, you’ve got everyone who upvoted your product the first time around. Go back to your original Product Hunt listing, collect the Twitter user names of your upvoters, and then start composing original tweets to each one. You don’t want to blast hundreds of tweets at once, so try seeding them throughout the week after your launch. Since Twitter lets you save tweet drafts, you can do this from within your account. 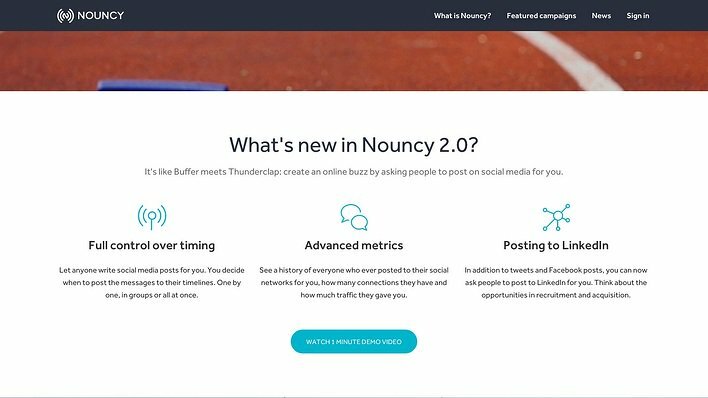 But using your social media scheduling tool (like Buffer or Hootsuite) will be less of a hassle. Write all of your tweets in advance, then schedule them in batches. Twitter is actually really important to your launch strategy. Every day, each member of the Product Hunt community gets an email of all the products their Twitter network upvoted—so, for example, if you’re following Robert Scoble on Twitter, and he upvoted the iPhone 6s, you’d get an email with a link to the 6s. So if you’re trying to decide where to focus your energy, prioritize Twitter. One of the awesome things about being listed on Product Hunt is the spin-off press it can generate. If you’ve been listed before, go back and see which tech bloggers or journalists covered your product. Thanks again for featuring my team’s product, [name], back in [month/year]. It was awesome seeing our name in [publication name]! 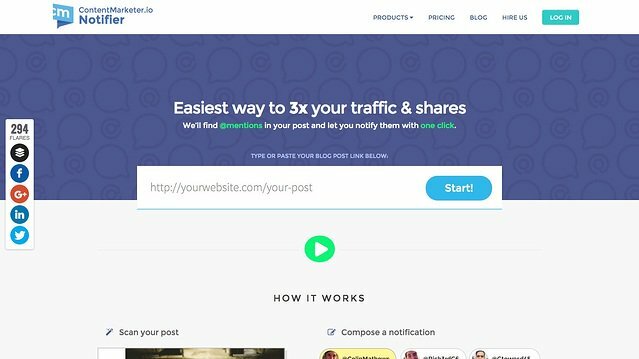 Today we launched [the latest version of our product/a new feature] on Product Hunt, and I wanted to shoot you the link in case you were interested in checking it out. If you’ve got any questions, I’d be happy to answer them! Never been listed? Technically, you can use this approach with anyone who’s covered your product. To drive maximum traffic to your PH page, leverage the public communities you and your team members belong to. For example, your product manager could share the link in the product Slack group she belongs to. Your salesperson could hype it in his LinkedIn group for SaaS sales professionals. Your technical lead could encourage everyone in her Women in Tech Facebook group to check it out. If you have a 10-person team, and each person posts in two communities, generating six upvotes each—well, you’ve already scored 120 votes. Products in the top five spots of PH’s Popular Feed typically have between 800 and 200 votes, so you can see why this strategy can have such a big impact. Ask each of your team members to come up with at least two communities they could use to drive traffic to your page. You might want to do this in a Google doc, on a Trello card, or in some other shared file, so that people don’t unknowingly choose the same communities. Having everyone post to their communities should be part of your launch day schedule, just like reaching out to your supporters and contacting the media. You should also pre-write the materials you’ll use to introduce your product. Developing a tagline can definitely be tough. To engage with old users, you have to communicate what’s new with your product—but to attract new ones, you need to highlight the core value proposition. Headspace proves this task isn’t impossible. The tagline for Headspace 2.0 is: “Meditation made simple [total redesign].” You instantly understand what’s changed and what the product’s value prop is. And don’t forget to incorporate new features or versions into the “bigger picture” of your brand, Byrd cautions. Yeah, this might be a small detail, but a little bit of personalization goes a long way. Besides making hunters feel special, creating a new landing page lets you customize the page copy and design to your main goal. With this goal in mind, you’d create a landing page that assumes most of your audience has a basic understanding of your product. But if you want to use your PH launch to get new users, your landing page would spend more time explaining your product’s core value proposition—because these new people will want that context before they sign up. 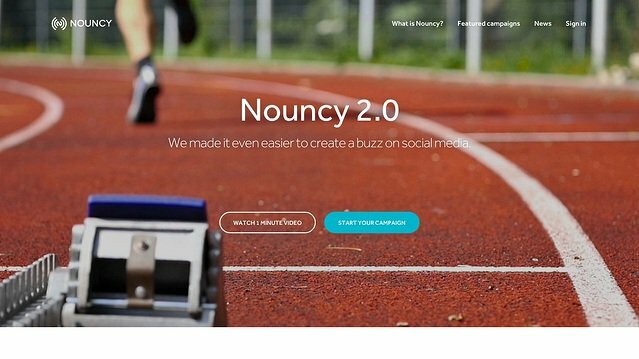 The Nouncy 2.0 landing page takes the first approach. 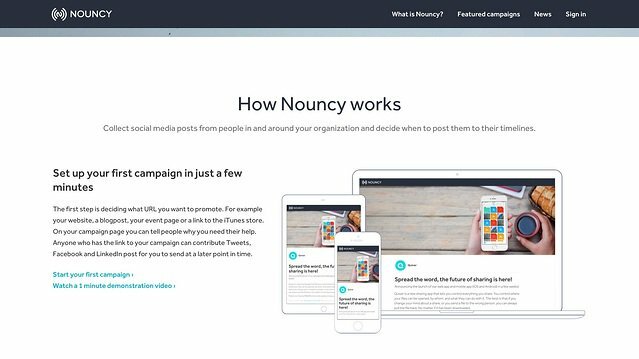 The tagline (“We made it even easier to create a buzz on social media”) would make sense to someone who knows what Nouncy does, but not to someone who’s never heard of the app before. Next, we get a nice run-down of the updates. Finally, there’s an intro to how Nouncy works. Since this section is so far down the page, it feels like an afterthought. You should also make sure your call-to-action buttons reflect your primary purpose. 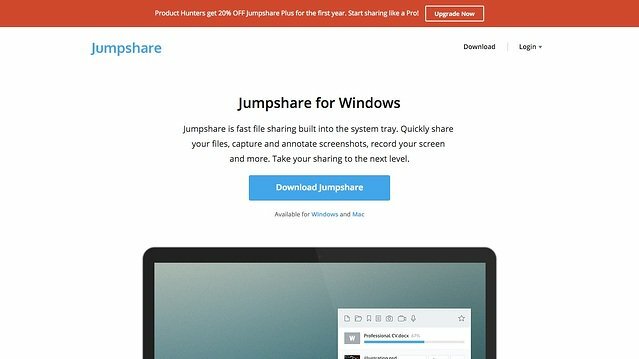 Jumpshare’s landing page for its Windows app is a great example. But if you want people to use your new feature, design a CTA that’s specifically about trying that feature out, as Content Marketer.io did for its Notifier launch. As most Product Hunt enthusiasts know, many makers offer exclusive discounts or bonuses as part of their launch campaign. There are a couple advantages to doing so. Your product gets a cool star emoji by its title, which A) makes it look special and B) encourages people to click on your page from the home feed. The average PH deal is X percent off for Y months, or buy one get one free—you know the deal. But since you’re relaunching, why not be a little more creative? When waiting list app Maître launched, it offered Hunters an attractive (but still pretty standard) discount: for three months, you could create as many widgets as you wanted for half the price of one widget. However, the team raised the stakes by saying they’d give Maître away to all up voters for 70% off—if the product finished first in the Tech category at the end of the day. When you’re creating a discount, incorporating some sort of time or competition element is a fantastic way to make it more fun and engaging. Also, try to make your promo as easy to understand as possible. While Maître did a great job gamifying their discount, the value of the original discount is really hard to figure out if you’re not familiar with their product and pricing (which most Hunters wouldn’t be). Before you launch, it’s a good idea to look at (and potentially update) your site’s support content. After all, you’ll hopefully have tons of new users—and you want to make it as easy as possible for them to use your product. So first, is your knowledge base in awesome shape? It should be up-to-date, well-organized, and fun to read (or at least, as fun to read as support content ever gets). Also, make sure it incorporates your new feature or latest release. “Before every launch, we update our support and success processes with the most recent feature/product documentation,” Byrd says. 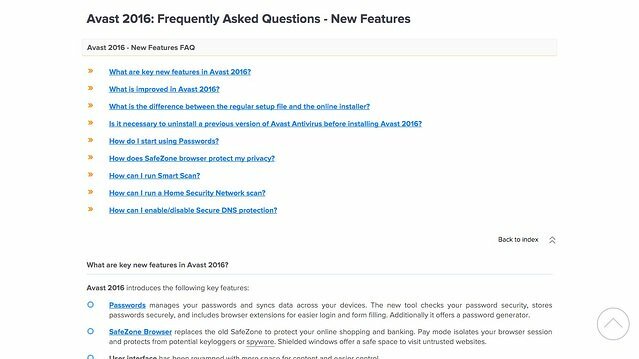 If you’ve been beta-testing your latest version or feature, look through the questions and issues that came up the most, and turn each into a short, concise article. Second, review your onboarding process. If your core product has been completely revamped, your old onboarding workflow clearly isn’t going to cut it. But even if you’re just launching a new feature, it’s still worth looking at your onboarding process. Again, if you’re successful, you’ll see a large uptick in new users, so will their first experience with their product be as good as you can make it? If you want to learn how to build a fantastic onboarding process, check out our user onboarding academy. Follow these steps, and you’ll be well on your way to a smashing Product Hunt success.